Atom is an inspiration and he knows that. One time I went to watch him play soccer in University of Makati for the Adobo Cup. 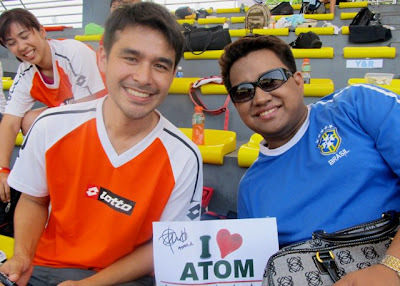 I brought with me this little banner that says ‘I Love Atom’. He was so nice that he signed it. You can just imagine how happy I was then! By the way, Atom is an athlete just so you know guys. He has trained in tennis, volleyball, taekwondo, mountaineering and platform & underwater diving. There was also this instance when I tweeted him asking who’s his fave author. When he responded Neil Gaiman, I hurriedly went to FullyBooked, bought him 2 graphic novels and went to ABSCBN hoping I get to see him. Fortunately, he was just in Starbucks having merienda. Heaven was so in my favor! I gave him the books and had a very little conversation. Then after few minutes I became speechless and my knees started shaking so I bid goodbye right away. Atom projects a reserved aura. I’m not sure though if it’s required for News Men. That’s how I see him; mysterious and strictly holding back. But definitely he is not a snob or ‘suplado’. I remember reading an article where he said he is an introvert, shy and a home-buddy. He is not anti-social but would just rather stay at home; sleep or read books. His fave authors are Ernest Hemingway and Ian Mc Ewan. Atom is proud that he was once an activist and that he joined protest marches when he was younger. But I think now, he doesn’t like it anymore. Again, I just think.. For today’s time there are other ways to voice out your opinions and your disappointments. Atom’s real name is Alfonso Tomas Araullo and turning 31 this October 19. He graduated at UP with a degree in B.S. Applied Physics. He stands 5’10, weighs 155 lbs, wears a medium size briefs, medium size shirts and size 9 shoes. He knows how to play the guitar and flute. He used to teach Introductory Journalism course in De La Salle Dasma. If it was just near to me I would have enrolled then. He studied elementary at Ateneo and was a scholar at the Philippine Science High School. 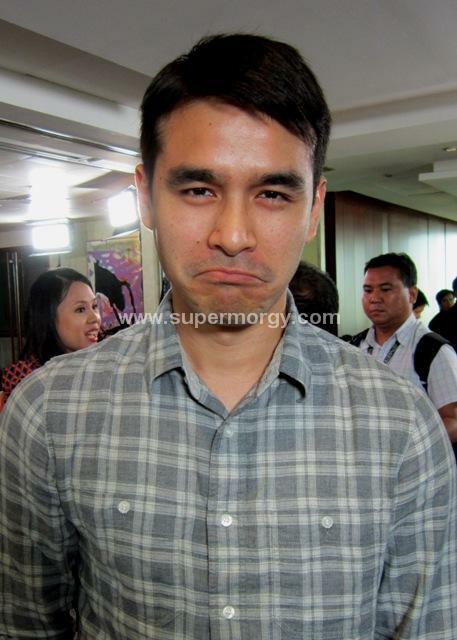 He did a stint as a co-host of GMA7’s ‘5 & Up’ with Chynna Ortaleza and Maxene Magalona. He pursued theater after his first year in college. Then after graduation, he co-hosted Studio 23’s Breakfast with Ryan Agoncillo, Bianca Gonzales and Bam Aquino. Currently he is hosting ABS-CBN’s “Pinoy True Stories : Hiwaga” every Friday at 4:15 p.m., which tackles paranormal phenomena, mysteries and the unexplained. He is also a field reporter of ‘UKG’ and TV Patrol. Atom is currently single and likes girls who are critical thinker, confident and independent. He has been offered to act in Indie Films. But as much as he would want to try it, the station won’t allow him. It’s a rule of ABS-CBN for journalists not to cross over to entertainment. Good thing Atom loves documentary making. He can explore film in that aspect just like the North Korea documentary he made. (click here to watch videos and previous entry) He also loves photography. Check out his Instagram! @atomaraullo to see the photos he took. This September, Atom Araullo will be joining Anthony Pangilinan, Francis Kong and Miriam Quiambao for a Talk entitled “Excellence in the Work Place, Becoming the Best You can Ever Be” at the SMX Convention Center in Pasay. 1pm-5pm. You can call Ticketworld for tickets 891-9999 or visit their website www.ticketworld.com.ph. Prices Inclusive of Service Charge are: Gold – P1560, Silver P1040 and Bronze P520. Note: Credits to The Philippine Star for some of the info I read about Atom.